When everyone speaks about development in India, the domains that get automatic attention are economics, finance, and business. No wonder then that next to politicians and bureaucrats, the experts who seemingly gets to call the shots are economists, financial wizards, management gurus, legal experts, and the like. But is this how a nation really progresses? To put it simply, no nation including India has so far progressed on such expertise alone, and no nation will do so in the future too. It is no coincidence that every top ranking nation by prosperity in the developed sphere is a de facto leader in two other fields that often goes under-mentioned – science and technology. If USA or EU or Japan or Korea, or even our neighbouring China, has come to command respect the world over, such respect has been painstakingly built on the building blocks of science and technology. India too has sterling examples in these domains, with the most noteworthy being our IT services industry, our automotive sector, and our space program. But unfortunately for the nation, we have fallen far behind others so far in ensuring comprehensive prosperity for our citizens based on progress in science and technology. Prime Minister Narendra Modi is very well cognizant of this shortfall, and it shows in the person he has handpicked to head the crucial Science & Technology Ministry. Dr. Harsh Vardhan is not only a man of science, due to his medical education, but an achiever in applied science. 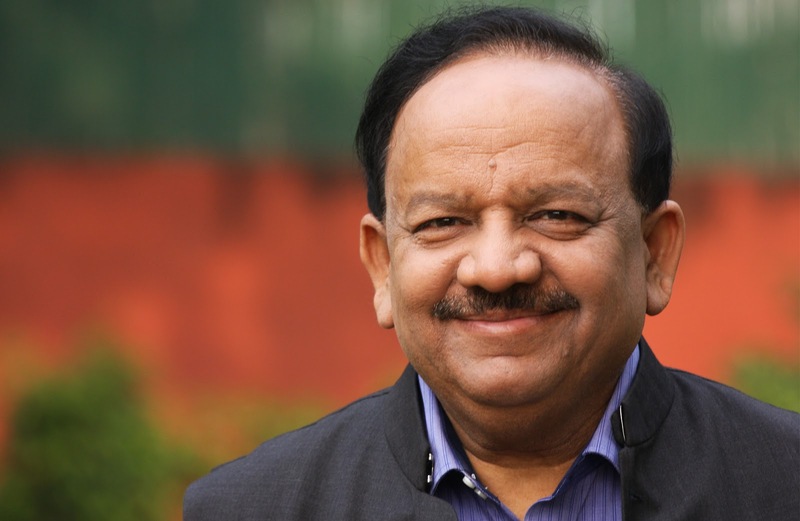 Internationally acclaimed for his leadership role in the polio eradication program, Dr. Harsh Vardhan is someone who has taken science to the masses for their upliftment and well-being. In his current role as Minister for Science, Technology, & Earth Sciences, he is leaving no stone unturned in ensuring that the full prowess of his ministry is behind PM Modi’s ambitious programs like Make in India, Startup India, Swachh Bharat, Smart Cities, Clean Ganga, and every such initiative. Indeed, he is the face of science in Modi’s cabinet. We have very few centres of excellence (CoE) be it with respect to IITs, IIMs, AIIMS. In a country with over 1.2 billion population, don’t you think there needs to be a greater utilization of these resources given the paucity of time in developing newer ones? See, it has to be dealt with at 2-3 levels. Firstly, we have to optimally utilize already existing services and manpower in these institutions. Secondly, there has to be a continuous process of upgradation of existing facilities and technologies. In the field of health, we offered proposals for the conversion of district hospitals into medical colleges and further a medical college being upgraded to an AIIMS-like status. Thirdly, there needs to be creation of more and more state-of-the-art facilities. As you can see under the current government, there are new AIIMS and IIMs coming up which is a testimony to our commitment towards excellence. In the budget speech, the FM proposed the setting up of 10-20 state-of-the-art international standard universities. So the problem that you posed is being attended very meticulously and scientifically. You have been active behind the Clean Ganga campaign. Any revolutionary measures that you would like seeing deployed? For the ‘Namami Ganga Project’, we have involved all the ministries, not just the Water Resources Ministry. The Environment Ministry and my ministry have been actively involved as well with a lot of research going on in this front. For cleaning the polluted water, we are looking into the use of biological inputs. It is a multi-pronged, thoroughly comprehensive strategy with the involvement of the local people. Recently, Ms. Uma Bharathi involved all the MPs and the people near the Ganges plains so that local participation increases and awareness is spread. The scientific aspects of some of the related research are being strengthened. This is a very important issue as far as this government is concerned. I sincerely think that in the next few years we will see a perceptible and measurable difference. Do you think India has rightly tapped the country’s vast resources in medicinal plants. How do you plan to addresss this issue? Medicinal plants have a huge potential. A lot of labs in Assam and Jammu are looking into this. I was recently in Leh, Ladakh where we took a huge piece of land which will be an extension of our laboratory to improve on our existing facilities. This is in close association with the Indian Institute of Integrated Medicine in Jammu. The focus is largely on aromatic plants. Also, for the process of standardization of our indigenous systems and plants and their outputs, there is also another facility coming up in Jammu. Recently, we produced an anti-diabetic drug called ‘BGR-34’ from the ayurvedic extracts of certain plants. It has been well received by people and it has been proven that it significantly lowers blood sugar level. The Health Ministry has proposed spending 5000 crores solely for improving the indigenous systems, whether it is Ayurveda or homeopathy. Therefore, the utilization of medicinal plants is a passionate exercise for us. You recently launched a solar power tree. What are its advantages and is it a scalable model that can be improved and deployed across the country by CSIR by licensing to private companies? When you license something, one should start from somewhere. In the initial stages when a product is developed, nobody wants to take the risk and which would later on require scaling up. A solar power tree has been installed right outside the premises of this office. In an area of 4 square metres, which would otherwise require 400 sq metres, we have managed to install a power tree which can generate some 5 kW of electricity. This will have a huge potential in the years to come. Although the current production and installation costs come up to almost 5 lakhs, in the years to come we should be able to bring it down considerably by subsidizing the industry. India has been lagging in developing pure science vis-à-vis technology, and with nations like USA renewing their efforts to lure brilliant science and maths graduates from across the world, how do you plan to pause or slow down this brain drain? Let me tell you, this was something of the past. The trends have certainly reversed. Now it would be appropriate to term it as ‘brain gain’ in our favour. There are a variety of schemes and fellowships like the Ramanujan and Ramalingaswamy fellowship where we invite scientists from abroad to teach in good quality facilities. In the last 2 years, almost 250 scientists have come back to India. As far as fundamental science is concerned, there had been tremendous progress under this government. We are in the process of setting up of a centre to study the gravitational waves, which will only be the third of its kind in the world. In terms of scientific publication, we are sixth in the whole world. In nanotechnology, we are third in the world. And in terms of patents being converted into commercial application, it is close to 14% in India. We have a good standing in most parameters and there is no reason to fear our prowess and potential in scientific and technological research. When it comes to technology, Indian efforts have been more toward exploiting the low hanging fruits like IT services outsourcing rather than IP based innovations that can create truly world class companies. How is your ministry attempting to address this issue? I don’t agree with this assessment at all. We are doing exceedingly well in the start-up industry and the PM has personally taken a special initiative to ensure that any young man or woman with an innovative mind can take their dreams to the next level. Close to 10,000 crores have been earmarked for this. There are numerous business incubators and technology parks being backed by the government. There are a large number of schemes to help young people to realize their dreams because we are currently in an ‘idea-based economy’ where the innovation co-efficient becomes very important. Nothing is being compromised even when it comes to filing of patents at the national and international level. But we are definitely trying to keep pace with the rest of the world because ultimately it is about streamlining processes. Every decade or so, a new revolutionary technology comes along, and it offers opportunities to once again enter the missed bus of tech driven leadership. This time around it seems this innovation is Internet of Things. What are the ministry’s broad plans to get a rightful place in the emerging IoT ecosystem? It is not just in IoT, but the government is taking a keen interest in the other emerging trends also like artificial intelligence (AI) and cybersecurity etc. We are stitching international alliances and collaborations to take such initiatives forward. For AI, we have a tie-up with Japan and with respect to cyber security we are forming a working relationship with Israel. Therefore, we are working with the best of the minds from all over the world. We are focused on doing the groundwork for this in all possible ways with a clear understanding and awareness of the fundamentals. Employability of our science and technology graduates has taken a beating in recent years with the proliferation of low quality private institutions. As the Minister in charge of science and technology development how are you interfacing with HRD and Industries ministries to address this challenge? In our own department, we have instituted a lot of scholarships, with the help of the HRD ministry. The underlying mission is to promote science in a big way. Lecturers in our universities and specialists in laboratories are now actively visiting schools and rural areas to impart their expertise. A large number of programmes have been rolled out to protect women scientists from being deprived of a chance to pursue their dream due to family and societal issues. This government is committed to the task of strengthening the indigenous industries through the Make in India initiative, but also is open to accepting FDI in most areas. We have absolutely no reservations if FDI can influence the financial growth of the nation and economy. Even in the field of science, we look to encourage local scientists and indigenous practices and systems but are actively looking at international collaborations. Quality of research has been the Achilles heel of Indian universities and colleges, preventing them to be counted among the world’s top 100. What are your solutions for this issue? I don’t think it is either an issue of quality or lack of research but there is an urgent need to reorient the focus of our research. We want to make it more people-centric and ensure that it is used for spreading the scientific breakthroughs in a big way. Also, I don’t think it is a fair comparison because every country has its own unique situation and this may merit the need to have specific parameters to measure on a country-by-country basis. I agree with you that if there is scope for improvement, we should definitely invest all our energies to ensure the same. Can you provide some instances where science and technology can be put to use for improving sanitation or health problems like, say, readymade toilets that can be mass produced and deployed? We are doing a lot of research on sanitation with the help of science and the bio-toilets developed by our bio-technology department is one such endeavour. We are also in touch with the Railway ministry to improve the condition of toilets. A lot of new drugs have been discovered over the years and the Ministry is committed to leveraging science and technology to explore the field of medicinal advancements. One example would be that of the Rotavirus vaccine used to prevent diarrhoea in children that has been produced by the science department and research in biotechnology. We have been able to do this at 1/5th of the cost as compared to our colleagues in America. We also have collaborated with AIIMS, IITs, IISc for the production of various biomedical appliances and the latest technology in the field. Overall, it has helped in cost reduction and the Make in India programme is also strengthened with the fillip for indigenous production. The impetus given to medicinal plants and their utility is being tested in our laboratories. We are also ensuring that the waste to wealth technology in terms of how to convert plastic waste for use in road making, to construct lightweight toilets, for radiation shields is actively promoted. Not to forget the conversion of solid waste into energy. We are also on the lookout for the best practices from around the world in the field of solid waste management. There is another project worth mentioning which is the conversion of bio mass into 2nd generation ethanol (cellulosic ethanol) and which has been successfully established in Kashipur. With this we can now convert 10 tonnes of biomass into 3000 litres of 2G ethanol in less than 24 hours. This has been primarily managed by the laboratories in the Indian Institute of Chemical Technology in Mumbai. Also, from crude oil, we not only produce diesel and petrol but have gone one step further in creating soft paraffin wax. We have established a factory for this in Numaligarh, Assam. There are countless other achievements and breakthroughs that I haven’t mentioned. But, the potential of science is quite remarkable and it really, the sky is the limit. You have exhorted recently that medical education standards are degenerating and that it is time for an overhaul. Are there any specific measures in your mind? I agree with you that there is a need to revamp the medical education system. There is a need to relook the functioning of the Medical Council of India and to bring about reforms in the educational space. Though it doesn’t fall under my domain right now but I can assure you that the government is looking into these aspects seriously. What can be done to deploy more doctors in rural India, according to you? People are travelling thousands of kms and waiting months or years to be treated at facilities like AIIMS? There is a shortage of doctors in this country, no doubt about it. And more especially, we are short of specialists. Some measures have to be instituted with the consultation o all stakeholders and there has to be a uniformity such that that no health facility should be deprived of a doctor. And also to ensure that there are no surplus doctors in a particular area or place. By and large, the deployment of doctors has to be linked up with completion of education, but this has to come out of a genuine consensus and the availability of an ideal atmosphere for the measures to be implemented. There are many doctors working in the tribal areas selflessly irrespective of whether they are posted there or not. So if the doctor can be adequately taken care of, then the situation at hand can be somewhat managed. You have come down on AAP Government heavily for not attending to Delhi’s cleanliness and instead continuing to criticize PM Modi. What according to you can be done for improving cleanliness in Delhi? Isn’t it also an awareness issue among the masses? I believe cleanliness is an issue everybody has to contribute towards, not just the government and NGOs. The mindset over the past several years has been that it is somebody else’s duty to keep our roads and public spaces clean. Of course, the state government is crucial in terms of extending support and providing resources to undertake the same. In general, it is not only the Swacctha or cleanliness issue. But there are various other issues which the government is answerable to the people of Delhi. But it seems to me that the leadership of Delhi is hardly interested in the welfare of the people. Their politics is focused only on one thing and that is to abuse the PM. Knowing fully well that they will get media attention, they use unparliamentary and unkind words to smear his image. I partly blame the media for this because they air negative stories hoping to profit out of it. They think that hurling abuses day after day will give them the required ammunition and standard which they are badly mistaken. One achieves a level of respect only through good and hard work and that is what the PM has shown over the years, even when the media and opposition parties have been viciously targeting him. However, he faced it in a dignified manner and the result of his relentless patience is there for everyone to see. Unfortunately, the people have been disillusioned with the Delhi government with news of everyday scandals and controversies painting a sorry picture of the government. The AAP presumably seems to be crying out for statehood for Delhi; is that a viable and realistic proposition? Let me tell you quite candidly that they are just playing politics over this issue. If they are sincere about this, they should present adequate proposals for the same and be willing to discuss this with relevant stakeholders. Also, I must add that the issue of statehood for Delhi has been in discussion over the last 40-50 years, irrespective of the government ruling the Centre. However, this issue requires considerable deliberation and brainstorming and there are institutions like the Parliament and diplomatic offices and mission which come under the purview of the Central government. It would be difficult for the state government to handle all of this alone, but we believe there should be meaningful discussion on how the powers can be distributed in the best possible manner and how you can achieve better status and at the same time ensure that it doesn’t compromise on the security and welfare of the VVIPs living in the capital. However, the present Delhi government will never ask for a meeting with the Home Minister to discuss these matters because their concerns are borne out of political reasons. It is safe to say that nobody appreciates this kind of politics. You have been a champion of utilizing religion for furthering various causes like vaccination, and now cleanliness. Can you elaborate on how far can this be taken in an Indian context? I think it is India that can create a model that can be replicated and I say this with conviction. When I started the polio eradication movement in Delhi in 1993 when I was the health minister, at that time, India accounted for 60% of polio cases in the whole world. And Delhi accounted for 10% of that figure. Where I lived, that is the Trans-Yamuna area, had the maximum cases. We had a clear strategy but there were no takers for this strategy. When I dreamt of making India 100% polio free, most people mocked me. They wondered how it was possible in a vast country like India to convince every mother to bring their child to a polio vaccine Kendra. My response was that if we can provide ballot paper to everybody, we should certainly be able to administer vaccine also. When I started working on this in early 1994, for virtually 9 months, I utilized everybody’s services including local religious leaders. In a meeting with a local Sikh leader of that community, I was able to ensure the daily announcement of the free polio vaccine to close to 500 gurudwaras. The appeal was that this wasn’t a political message but a plea to bring their children to these centres to achieve the objective of a polio-free nation. Similarly, I had done this with the Church of North India taking the help of archbishops. I also reached out to the Shahi Imam of Jama Masjid and the chief of Delhi Wakf Board which helped to publicize the message to around 300 mosques. However, it is not that only the religious leaders were used. We had the active participation of school teachers, students, NSS and NCC scouts. I remember that in the early part of the 21st century, India had a setback in terms of polio cases in spite of the fact that there were successes along the way. This was largely because of U.P and Bihar. At that time I used to work as an advisor to the WHO and was part of many high powered international committees dedicated to polio eradication. Therefore, the rise in polio cases in India became a concern for the whole world. When Atalji went to the US in 2001-02, Mr. Clinton was the President at that time and the stark reality was brought to my notice by Atalji, who was closely associated with the polio-eradication campaign in Delhi and when he became Prime Minister, he spearheaded this at a national level. However, a bit of a concern during this time was a baseless rumour being spread from some quarters that polio vaccination causes impotency and this primarily impacted the states of U.P and Bihar. We put out posters with the message of the Prime Minister regarding the polio drive and appealed to the clergy, imams and religious heads of local mosques to come forward earnestly. Atalji was able to get this rumour out of the minds of the people and when the community started supporting us, it ultimately achieved the objective of the campaign which was solely to make India 100% polio free. This convinced me that for any non-political programme, people should not have objections and there needs to be a bi-partisan support from all political parties. Recently, I was in Leh where the religious leaders from all the major faiths congregated and took a pledge in front of students to work toward the Swacchta and Sadhbhavana mission of the PM and on the banks of the Sindhu, we unfurled the Tiranga and jointly took a pledge. This message would then be effectively disseminated to the millions of faithful about our social and national duty towards maintaining cleanliness. It removes the threat of diseases and gives a fresh air of breath. Therefore, to conclude, I believe that religious leaders should come forward proactively to spearhead such campaigns because after all religion is all about the establishment of truth and values in society and being in the larger interests of society, every religious leader should instill a sense of responsibility in each person as their words are taken seriously. Take for example, Baba Ramdev’s laudable efforts at spreading the virtues of yoga because it improves the overall health of the society and nation and taking a cue from Ramdev, PM has given it international attention. Therefore, I am strongly for using everybody’s energy in improving the welfare of the common man.